The Ekatm Yatra has been launched by the Madhya Pradesh government to collect metal pieces that would be used to install a statue of Adi Shankaracharya in the state. 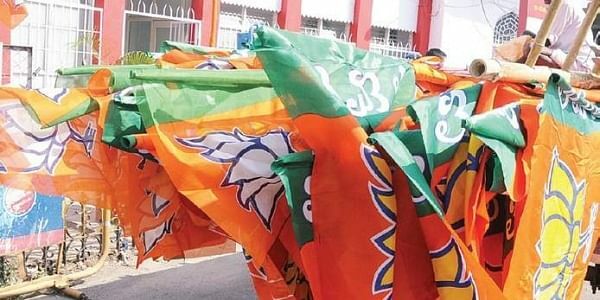 BHOPAL: A Bharatiya Janata Party (BJP) legislator has been allegedly assaulted his own party workers during the Ekatm Yatra in Madhya Pradesh's Agar Malwa district. In a video that has gone viral on social media on Wednesday evening, two persons are seen indulging in a scuffle. The fight broke out over holding the Ekatm Yatra flag, and the person who was being assaulted held a flag. Later, it was revealed that Gopal Parmar, a BJP legislator from Agar, was at the receiving end of the blows. Parmar has blamed Manohar Untwal -- an MP from Dewas in Madhya Pradesh, and his supporters for the incident. "The video on social media is real. Madhya Pradesh BJP president Nandkumar Singh Chauhan has been told about the matter," Parmar told IANS. Meanwhile, Untwal could not be reached for any comment on the issue.